Representative Phil Potvin, like many Republican politicians, likes to highlight his business experience when running for office. Potvin’s father James co-founded Western Concrete in 1946. James Potvin ran Western Concrete until the mid-1980’s when Phil took over. Under Phil’s leadership at Western Concrete the company effectively went out of business. Potvin’s official bio states that he “continues as a consultant to the company for property management in Big Rapids and Cadillac.” According to a sign at the Cadillac location, the property is currently for sale. The problem isn’t that Potvin may have ran his father’s business into the ground. The problem is what his business buried in the ground while Potvin was the CEO. In May of 1997 an anonymous message was received, and an investigation launched, by the Department of Environmental Quality (DEQ). Recently, documents from that investigation have surfaced. According to the report, chemicals were disposed of in a below ground elevator shaft at Western Concrete’s Cadillac facility in 1986. The shaft was then covered with dirt and concrete. 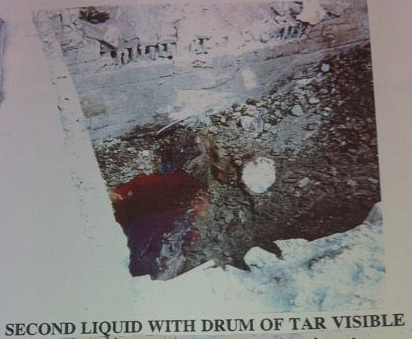 DEQ’s picture of toxic waste at Western Concrete. Two different witnesses said much of the dumping took place over a weekend sometime in 1996. The employees left work on Saturday afternoon and returned on Monday morning to find chemicals dumped in the pit. It is likely that the dumping occurred by someone in management. Interestingly, Potvin himself was working at the site of the dumping on a Sunday afternoon on the day of this blog posting (10/7/12). 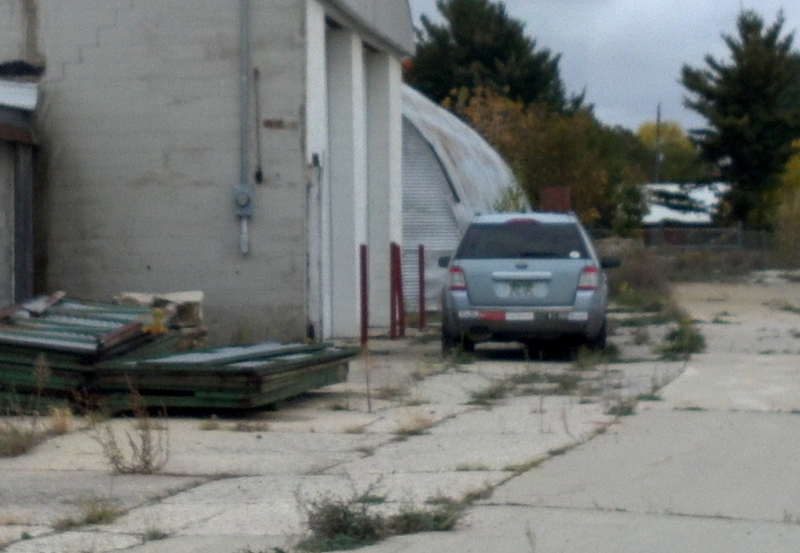 Potvin’s car at site of dumping on 10/7/2012. One witness said he doubted many Western Concrete Employees would want to give the DEQ information on the dumping because “Phil would make their life miserable. 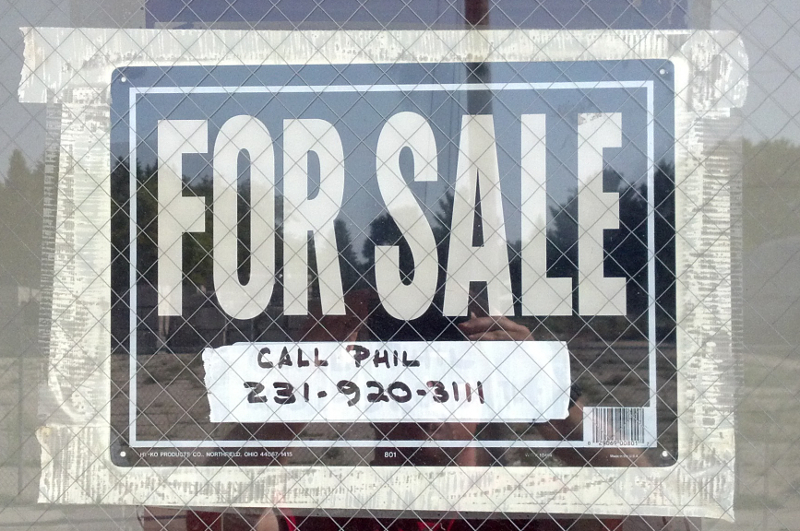 They’d have to quit their job.” He said Phil is a “vindictive . . . little prick.” The witness believed that the dumping occurred to save $30,000 in disposal fees. If you think it cannot get worse than that, it does. The chemicals were dumped about half a mile from the city’s well field. 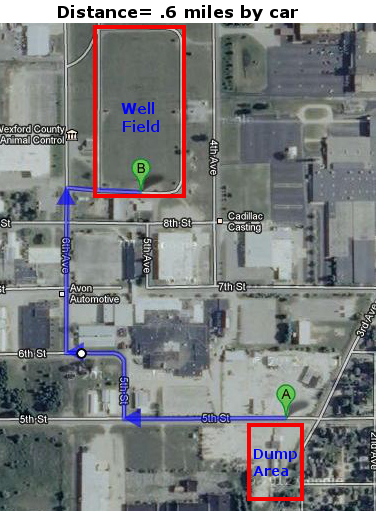 The well field distributes water to over 10,000 Cadillac residents. According to the DEQ report, the walls of the elevator shaft were “cracked” and posed a threat to the drinking water. The DEQ report identified the chemicals as “hazardous waste.” They said Western Concrete “knowingly” violated over 20 parts of the Natural Resources and Environmental Protection Act. Documents indicate that Western Concrete had to pay for the cleanup of the site plus $162,500 dollars in fines. However, the company worked off about half of that amount by helping create the walking path known as the Clam River Greenway. It is unclear how much Western Concrete ended up paying between site cleanup costs, fines, and by their work on the Clam River Greenway. Almost 15 years have passed since Potvin admitted that his company dumped chemicals near the city’s well field. To this day no story on the dumping has appeared in the Cadillac News. In fact, only recently has any newspaper ran a story on the dumping, that being the Ferris State Torch. It appears that the DEQ does not have a policy mandating the release of such information. How can we trust that Phil Potvin will make decisions that protect the citizens of the 102nd District after his company put their very lives in danger by dumping toxic chemicals near their water supply? Representative Potvin should resign immediately. A law should be passed that requires the DEQ to regularly release the location of sites being investigated for pollution. The public deserves to know immediatley when their safety is being threatened. They also deserve responsible leadership in Lansing. This entry was posted in Phil Potvin. Bookmark the permalink.